This is a technical description of the mechanisms you might find helpful when extending backend applications. If you want, you can fast forward to the next section. 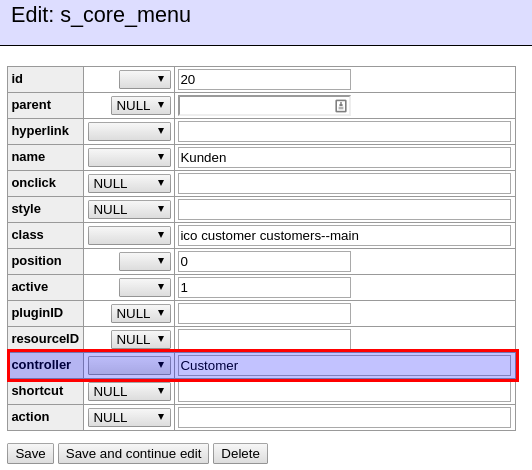 Every menu item can be found in the s_core_menu table of your Shopware database. As you can see, there is a database field controller which references the controller that will load the backend application. In this case, it is the Customer controller. In order to be capable of loading backend applications, we use special controllers in Shopware. By default, they will inherit from Shopware_Controllers_Backend_ExtJs. If the module is built using the new backend components, the base controller Shopware_Controllers_Backend_Application is used. In order to connect the controller to a backend module, naming conventions are used. In our example the controller is called Customer, so Shopware will search for a backend application in backend/customer/app.js. If your controller was called NewsletterManager, the backend path would be backend/newsletter_manager/app.js. So basically, controllers names are in CamelCase, backend paths are in snake_case. Generally speaking, we need to remember that a given backend controller Customer is linked to the backend/customer/app.js file. The index action of the controller will be used to load that app.js, which in turn will be used to load all other components. In this example, an extension for Shopware's default customer module is implemented. First of all, an existing free text field should be changed ComboBox with preset titles. At the end the modified FieldSet is returned - this way our extension is rendered into the window instead of the original one. In some cases, you also want to add whole new components to a backend module. This example might look similar to the first one, but there are subtle changes. 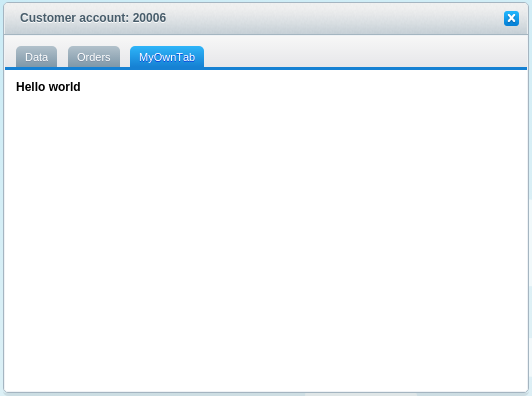 In this example, a new tab is introduced to the customer module, which will just contain a simple "hello world" message - but you could easily extend it to show custom data. The Subscriber looks similar, it subscribes to Enlight_Controller_Action_PostDispatchSecure_Backend_Customer and registers a callback method. After adding it to the app.js file, the file will be loaded, but the controller will not be instanced. The full example can be downloaded here.